It’s no secret that France is all about food. The producing of it. The cooking of it. The eating of it. Not to mention the talking about it. Every neighborhood in Paris has several butchers, several bakers, several wine shops... and several green grocers. When you move into a new neighborhood, it takes a while to compare them and pick your favorite, the one you feel is the best. It doesn’t hurt if the shopkeepers are friendly. They might even be cute (and here I’m thinking of a particular local cheese vendor). But what cuts the mustard is what they sell. The selection. The quality. And of course the price. People are prepared to pay a bit more - if they can - provided they feel what they’re getting is better quality. Yet it doesn’t matter how pretty you look if your stomach is growling, and so there's still a choice of food shops. Especially green grocers. In New York, they tend to be Korean or Latino, depending on the neighborhood. 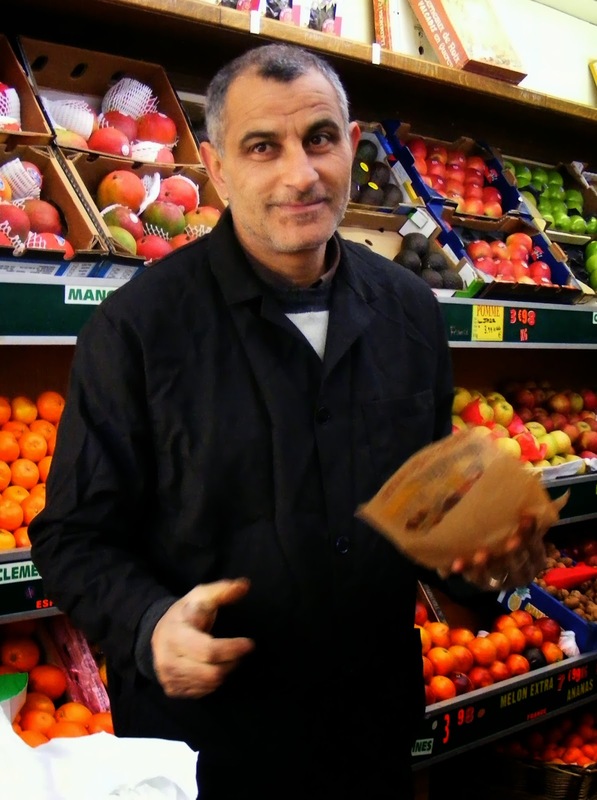 In Paris, they are most often North Africans... usually Tunisians... and even more specifically Tunisians from the island of Djerba, like the owners of Au Verger des Abbesses. I asked "why Djerba" and Tafouik replied, without skipping a beat, “Parce que nous sommes des commerçants” (because we’re shop-keepers). I asked him if there was anybody left in Djerba and he just chuckled. Of the three green grocers on these two blocks of the rue des Abbesses, mine is the one closest to my house. It’s wedged between the deli and the cheese shop (see above), kitty-corner from the wine shop (see People in Your Neighborhood - Caves des Abbesses, Feb 22, 2013) and close to the bakery with the pain aux céréales (fresh multi-grain bread baked right there). Why did I choose that one? Just look at their lettuce and their tomatoes, two good Revealers of Freshness (or the lack thereof)... as good a yardstick for quality as I’ve ever found. Nothing worse than wilty lettuce or tomatoes with soft spots! And here, the fruit and vegetables are always fresh as can be. And there's a wide selection. This shop wasn't always a green grocer's though. Fruit and vegetables moved in only 13 years ago, at the turn of the century - Y2K. Before that it was a butcher shop. The new owners transformed it on a budget, with as little work as they could manage. Business has been good for quite a while now so they redid the entire store this past summer, taking it down to bare bones. They made it bigger by minimizing the storage area in the back, even installing a sliding door to cut down on wasted space. They traded in the tired old mustard wall tiling and grey mosaic floor left over from the butcher’s time and installed warm brown tiles on both walls and floors. The harsh old neon tubes have been replaced by trendy recessed lighting. There’s new wooden shelving instead of the old DIY shelves, and beneath it the storage space once hidden by green curtains now boasts handsome wooden doors with molding. The front of the shop is equally handsome, with the same cabinetry as inside instead of the old plasticized plywood look, and there’s a brand-new fire-engine red awning to replace the tired, drab old green one. Not to mention elegant lettering on both awning and storefront. The wonderful thing about such small shops is that you can buy just one apple and no one gives you any lip. You can ask for juste une poignée (just a handful) of mushrooms or spinach leaves and you don’t get The Look. They’ll weigh just as much or as little as you want. They know you’ll be back. And they’re used to it because the neighborhood has a lot of little old people - holdovers from Montmartre’s former working-class era - who can no longer carry armloads of stuff up four flights to their apartment. Not to mention that, in general, French fridges are smaller than their American cousins by a long shot and can hold far less. Besides, everyone wants things to be fresh, so you buy for today and tomorrow and maybe the day after. After all, you walk past the shop every day. Another advantage is that you can ask them to get something for you. For instance, in the spring, when I arrive, I have to replenish my herb garden. The bay leaf bush will be fine, but other herbs are annuals or may have taken a hit over the winter. I ask them to see if there’s any potted basil or verbena or thyme and they take a look around the huge Rungis market the next time they restock, which is three to five times a week, depending on the season... and on business. And for seasonal things like morels or delicious melons de Cavaillon cantalopes, they’ll give me a heads-up when they’re expected in. Last, but not least, they’re always friendly. I’ve never seen them in a bad mood or shouting at each other. More often than not, they’re teasing one another. I always joke with them, so they like me. I find it makes the day go faster if people smile at you. And their days are very long - open six days a week, from 7 in the morning to 8 at night, and they don’t even close for lunch like so many other food shops do. Smiling also gets me such perks as a free head of lettuce from time to time, and once they sold me morels at half price - morels! a whole kilo of them! (Of course that was their last day before the work started and the place was to be gutted, but still, they could have saved them for someone else.) There’s always a candy for the little children, sometimes to the parent’s chagrin. And for the elderly and certain other people they like - or maybe everyone - they’ll deliver if you’re loaded down already but still buy an armful of fruit and veggies. They keep tabs on me, noticing when I’m gone. And over the years, I’ve seen the young men who lend a hand on busy week-ends (maybe sons or nephews?) grow out of their acne and into polished professionals. When I arrive from the States, they welcome me back. We all shake hands and they ask about my family, and where I’ve been. When they know I’m headed off again, they wish me a good flight. For all these reasons, a stop at the Abbesses Orchard (Verger des Abbesses) is part of my Paris routine. A delicious part. P.S. I forgot another innovation: bees! While I did my shopping the other day, Samyr was busy swishing away the bees from his fruits, especially the Damson plums known by the Alsatian word quetsches in French. He told me, "I don't know where all these bees are coming from. They were never around before." When I told him about the two places higher up on the slopes, and only a few blocks away, that now have beehives, he said, "That explains it! Mystery solved." It’s Kate’s birthday and I’ve got a bottle of white wine, as requested, plus some chocolates. To get to her party across town, I decide to take the 67 bus. It’s slower than the métro, but no need to change, and it lets me off at Kate’s building. 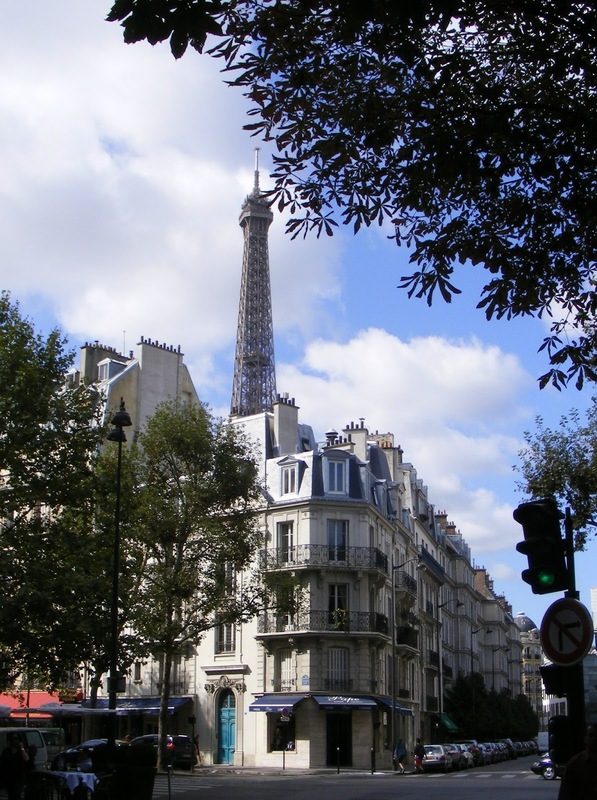 The 67 starts out from Place Pigalle and cuts across all of Paris, north to south. It offers quite a show. The Louvre... Notre-Dame... City Hall... the Seine... I have a book, but it’s hard to focus. This city represents half of my life. Probably the better half. It’s where my children were born and raised. It’s where I had my career. Memories can't help but float to the surface as the neighborhoods flow by. One neighborhood we pass through came into my life again and again. The need for a roof over my head was immediate. Hotels were expensive. One of the two strangers, Thérèse, found me a reasonably-priced hotel near her in lower Montmartre. It had a pub on the ground floor, within shouting distance of the front desk. There were several ladies in the pub who befriended me. They were there every evening, as of about 5:00. Only much later did I find out why. The other stranger, Alain, helped me find an apartment. My experience with renting was limited. And in English. This was Paris. Alain could spare one day. One. No more. He went over the want ads and narrowed it down to two apartments. One was in the 15th arrondissement, the other in the 5th, in the very heart of what had been Paris from its beginnings. We started with that one. I don’t remember much about that apartment. In fact I couldn’t tell you where it was if my life depended on it. 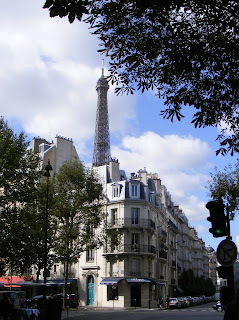 I remember only that it was at the Censier métro stop, right around the corner from part of the Université de Paris. 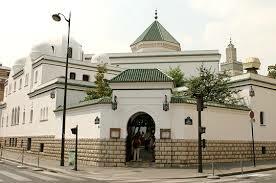 And from the Paris Mosque, which was something that lay very far outside the boundaries of my world back then. For some reason I didn’t take that apartment. Probably it was too dark or too small. Or the whole experience was just too overwhelming. So we moved on to the other one, and I lived there for a year. During that year I studied at the Sorbonne, where - surprise! - some of my classes were in the university building by the mosque, just around the corner from where I could have been living. Round One. Fast forward two years. I’m now a teaching assistant giving a course called Civilisation Américaine at the Université de Paris. I’ve been back to the States for a year to get a master’s degree and this time I’ve arrived in France with no job, no apartment, no return ticket and only $100 in my pocket. But I know the ropes a bit. I’ve been through this before. I end up in an eighth-floor walk-up chambre de bonne (a maid’s room) near the Eiffel Tower that costs me over a third of my pauper’s salary for one tiny room with a cold water tap and a Turkish toilet, both in the hallway and shared among all us students and immigrants on this top floor. The classes I teach are at Censier, that college around the corner from my almost-apartment, the same college where I once was a student. Round Two. My students are not that much younger than I am, but they’re interested in America, even though it’s a hard sell to convince them that “American” and “civilization” are not an oxymoron. As the months go by, the two classes - one following the other - fuse to make a single two-hour class. We move it from remote Censier to a café just down the street from the central “campus” near the Luxembourg Gardens. I’d read that Sartre did that - held class in a café - and it’s more convenient for the students. They begin to bring friends along, including a Black American musician. I break a lot of unspoken rules but my students improve their English by leaps and bounds. My contract is not renewed. Fast forward another ten years or so. I now have a profession that I’ve fallen into - not the one I thought I would have - and two lovely dual-national, multiracial children in a bilingual school by the Seine. We live in Montmartre. I drive them across town to it every day. At the end of the school year, one of the teachers decides to start his own school, one still “arty” but without all the “curtsey-and bow”. After looking around, he settles on an old garage that can be repurposed. And of course it’s right around the corner from that mosque and that department of the Université de Paris... and the apartment where I could have lived but didn’t, wherever that was. Every school day, we travel from our home on the hill of Montmartre to this neighborhood across town that has kept remembering itself to me. We do that for years. By car. By métro. And yes, by the 67 bus. Finally my children do it by themselves... by which time this neighborhood has imprinted itself on a second generation. The birthday party over, the oysters washed down with champagne, my 67 bus races the sunset across Paris in the late dusk of summer. Muted lighting on the buildings etches them against the sky. This city is heart-wrenchingly beautiful at nightfall. It takes your breath away. Once again the bus passes the corner where the mosque stands across from the college. And I smile. I’ve been doing these recipes on my website (www.sandyschopbach.com) for seven years now. Shortly after I started my blog, I included the website’s recipe of the month. That was in June of 2011. 12 x 7... that’s a lot of recipes! And who knows who has seen them? I have no idea myself. The website doesn’t have the feedback of the blog. So I’ve made an executive decision. From now on, I’ll be reposting the old recipes on the website, starting with the very first one, and posting them for the first time on the blog. That means that they’ll be entirely new to those of you who read my blog, and maybe new to people who happen upon my website now, because although the recipes are still all there (under Past Recipes on the Cuisine page), the intros are missing. From time to time, I’ll throw in a new one, just because I can and it’s a delicious one that’s left over... or new to me. And just to mix it up. So whether these are new to you, or “old friends”, I hope you’ll enjoy trying them if you haven’t and making them again if you have. It's the end of the summer, and those of you who have basil in their gardens know that it will die with the first frost. You'll go out in your garden one nippy morning and there it will be, laying on the ground, wilted and browning. When this happens to basil, it's too late to salvage it. It's gone. Rest in peace. And you'll be kicking yourselves for wasting such wonderful, sun-filled flavor. A perfect recipe for basil is pesto. You may think of it as Italian, but actually it's also southern French, as many of the same herbs grow in both of these Mediterranean countries: thyme, rosemary, oregano, marjoram... and obviously basil. In the provençal language, it's called pistou. But whether pesto or pistou, both stand for basil, the king of summer cuisine. - Using a blender or a food processor, grind up 1/2 cup of pine nuts. - Peel 4 cloves of garlic, cut them into quarters and add them to the pine nuts. (Make sure the garlic isn't sprouting. If it is, its taste will be weak and bitter, which may seem a contradiction. Don't use it. Or if you have to because the store is closed or it's too late to run out and buy some more, remove the green sprout from the center and add two more cloves.) Mix the garlic into the pine nuts. 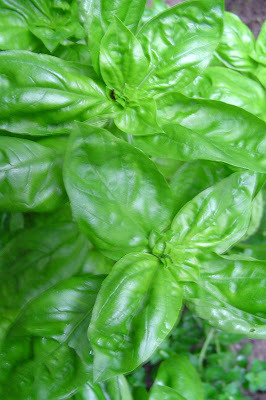 - Wash 3 to 4 cups of fresh basil, leaves only. From the garden is best, because freshness is very important. Just shake any excess water off; you don't need to dry it -- a few drops of water will get lost in the mixture. Add it into the blender/processor. - With the blender/food processor running, slowly pour in 1 1/2 cups of cold-pressed extra-virgin olive oil. The better the olive oil, the better the pesto. If you find the pesto is still too thick, add up to 1/2 cup more olive oil little by little. You want the pesto to be smooth but not too loose. After all, it should cling to the pasta, not run off and puddle on your plate. - Add freshly ground pepper to taste. (The equivalent of about 1/2 tsp is a safe amount; more might overpower the basil taste.) I don't add salt to my pesto because I feel the parmesan is salty enough, and many people nowadays are on salt-restricted diets. Besides, as I always say, it's easier to add it at the end than try to take it out. So taste it and if you find it's lacking in saltiness, then add some and give the pesto another spin or twelve. - Serve immediately over hot pasta, while the freshness of the basil is at its best. And try to convince your guests not to add any more parmesan on top; there's enough in the pesto itself and that would destroy the balance. Important: You can keep pesto in the refrigerator overnight, or two days maximum. BUT... I've never found a good way to reheat pesto. Microwaving it will turn it into one cheesy wad of chewing gum. Trust me; I've done it... and thrown it out. Heating it, even lightly, on the stove or in the oven tends to make the olive oil separate from the rest. So if you made too much (if such a thing as too much pesto is possible! ), I suggest taking it out of the refrigerator well in advance and letting it warm to room temperature. The steaming hot pasta will warm it to perfection. You can also freeze pesto, but if you do, remember to let it return to room temperature in its own good time.